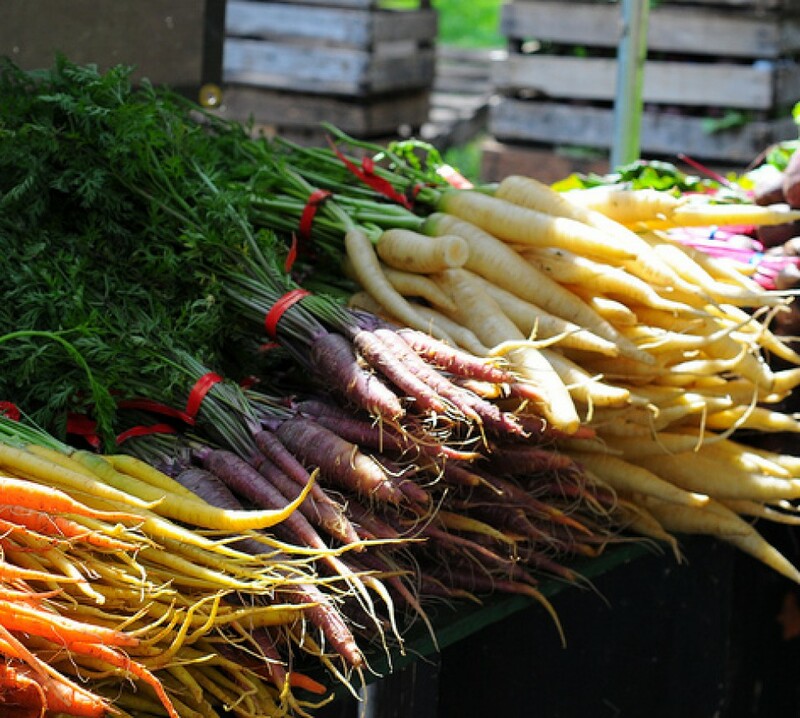 The beauty of having a well-stocked pantry is being able to change things up at the last minute if necessary and still get something good on the table. Our original plan, since Mike and I both had Monday off from work and could spend a bit more time cooking, was to do a series of New Orleans inspired dishes and nosh all day long. After running around in the cold all morning, then coming home and making three and a half quarts of homemade chicken stock, I was tired and achy, and the last thing I wanted to do was prepare an involved meal. We scrapped our original plan and decided to go simple. 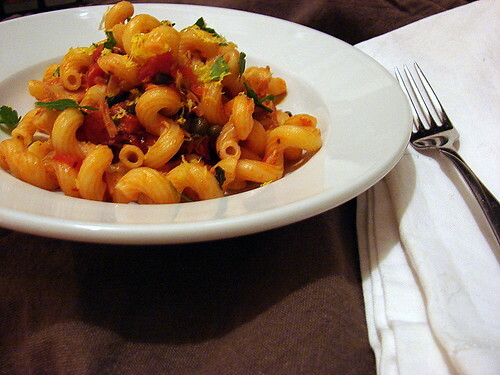 One of our favorite pantry staple meals is a pasta dish inspired by Giada De Laurentiis’ Fusilli with Tuna and Tomato Sauce. Her recipe provides a good jumping off point, but I like to add a little more kick to it with chile flakes and extra capers. I got a big pot of water boiling for the pasta, and then got to work on the sauce. I didn’t have any of my basic tomato sauce on hand, so I had to build a quick version first. I sauteed a chopped shallot in some olive oil, then added half a can of whole peeled San Marzanos with their juice and crushed them with a potato masher. I added a splash of white wine, some dried marjoram and chile flakes, and seasoned the sauce with kosher salt. We always have jars of oil-packed Italian tuna on hand, so I pulled the meat from one jar (leaving behind the oil) and added it to the sauce, breaking it up a bit with a fork. I added about 1/4 cup of nonpareil capers and a generous grating of lemon zest, and let it simmer away while my cavatappi cooked (I used half a box). When the pasta was just short of al dente, I added a small ladleful of the pasta water to the sauce, then added the pasta right into the sauce and tossed it through. Once the pasta had finished cooking in the sauce, I spooned it into serving bowls and finished it with some fresh flat-leaf parsley and more lemon zest. This dish has such a wonderful combination of flavors, and you just can’t beat a recipe that you can put together from things you’ve always got on hand, in just about half an hour. Wine Note: We drank Borgo Nuovo Nero d’Avola, which went really nicely with the meaty tuna, spicy chiles and hit of citrus in this dish. 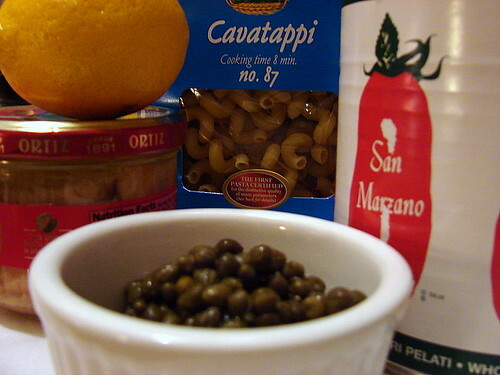 I love capers, particularly with seafood and/or citrus, so we always have them in the fridge. I will say that the ones we get from FreshDirect are considerably less salty and less vinegary than some of the jarred ones I have gotten in the past. And I have yet to try the salt-packed ones, but I spotted some at Formaggio in the Essex Street Market this weekend, so I will probably get some after the container we have now is gone. I don’t actually know what brand they are, unfortunately… FD has them bulk in their deli section, so when we order them they just come to us in a little plastic tub. If the Fresh Market by you guys is the same as the one by my parents, they should have an olive /pickle bar, and I am pretty sure Whole Foods does, too, so you might check there and see if you can sample them to see if you like them? How long does this sauce last in the fridge as a leftover? Mila – I’ve kept the leftovers in the fridge for a few days and they’ve been fine.